So my Protege is giving me these codes. I pulled my spark plugs and they are all white, (spark plug number two from the left of the drivers fender had some oil on the threads but non on the tip of the spark plug) which means its running to hot or igniton issues, car does not over heat, new water pump last year with timing belt. but I do get some detonation it sounds like some times when I am driving. for code p0300 i was going to try to get new coils, wires and plugs and see if that helps. for P0660 im not sure, i looked at the solonoids on the passenger side of the intake and they look ok none look melted or deformed in size. what else should I look for on this issue? would P0660 cause my engine to throw code P0300 or the other way around? Or do i have both these codes at the same time randomly? Last edited by P5freek; 02-03-2019 at 03:51 PM. I dont want to jsut throw parts at the car, I have read it could be egr, but how can i test my EGR to know if its good or bad? Do I have other issues underlying the codes? should I clear the codes and drive it and see if they come back? the CEL came on at low idle blinked for a few seconds then just went to solid CEL. If it were me I'd put some Seafoam in with the gas. You may have some partially fouled injectors. Some say Seafoam is crap but it's worked great for me. The P0660 code is most likely a bad solenoid. They get old and stop working but look fine on the outside. I would trust the code and get a new one. They're cheap online and at Rockauto auto but make sure the picture shown of what you're thinking of buying is the same as what you have. There is a few different solenoid valves for our car and some parts suppliers call them different names. The VICS not working properly could cause your P0300 code by being open or closed at the wrong time. I would get the VICS solenoid replaced first and see if that clears the misfire code although replacing your coils plugs and plugs is never a bad idea. The EGR misbehaving usually has more severe symptoms and can kill your car at any RPM. 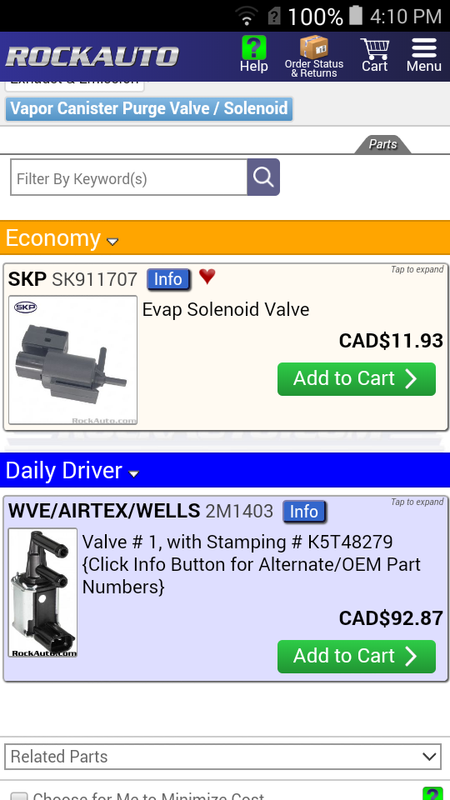 This I what Rockauto has listed under the same heading and they are different. Last edited by pcb; 02-04-2019 at 04:18 PM. I literally just cleaned my EGR valve like an hour or 2 ago. I had the rough idle situation for a while. In the past i had about 13 codes and after changing spark plugs, plug wires, o2 sensors and the bad VICS solenoid, and some other things i had, it dropped down to one. The p300. For the solenoids though, they might look ok but could be functioning improperly. I tested all of mine to see if they clicked open when power is applied and ended up finding one that didn't so i changed that one. After driving it for a while i decided to give the EGR a proper clean but that didn't happen for a little while because i couldn't get it off. I borrowed some low porfile tools and actually jacked up the engine a bit to make clearance to remove and clean the EGR (my bad motor mounts were the reason i couldn't get the ratchet on there. the eninge was actually sitting a little lower and closer to the mounts) . After i cleaned it correctly, it seems to idle much better but it is far from perfect. i reset the engine codes and drove it over 20 miles and it didn't come back yet . so i would look into the EGR and the solenoids like @pcb said. If it's an idle problem then cleaning your IAC might be next on your list. Getting the proper JIS screwdriver can really help. Last edited by pcb; 02-03-2019 at 05:55 PM. I threw a P1250 code about a year ago and went out to test my relay. I applied 12 V and it clicked... ?? Then I did it again and it clicked... ?? Then I tapped the 12V to it a whole bunch of times then it stopped clicking !! Solenoids and relays can be fussy about when they decide to fail. One guy had his P5 die on him when he was driving along. No one could figure it out and he was about to get rid of the car when finally a mechanic found out that the fuel pump relay was sticking. But it would only stick when the car was under full heat soak. A new fuel pump relay and he was good to go. I cleared the codes and drove the car no cel poped up but it coukd come back. The misfire code is instantaneous. The moment you get too many misfires you get a code. The VICS code needs some time to think about it. So i took the throttle body of expecting to clean it and the IAC... but you were right. i couldn't get the IAC odd for the life of me. going to get the right tools and try again with just the IAC since i managed to clean the Throttle body. I did noticed a change in my idle after this though. it seems better but still a d bit rough. So once i clean the IAC ill update. @P5freek once you change the coils, plugs and wires, i would highly recommend looking into cleaning the EGR, IAC, and Throttle body since we are throwing the same exact codes. it really has seemed to improve my idle a bit though not perfect. maybe the added efforts off all these combined will help out. After you clean the IAC I would recommend disconnecting the negative battery terminal and resetting the ECU. The ECU will "learn" how to idle with a dirty TB/IAC to try and compensate for the crud. Then once clean you can "create" idle issues that weren't there before just because the ECU is trying to compensate for something that is no longer there. I've had particularly nasty throttle bodies i've cleaned and then had the car idle at nearly 2k until you reset the battery. I bought a set of bits once I learned about JIS bits. 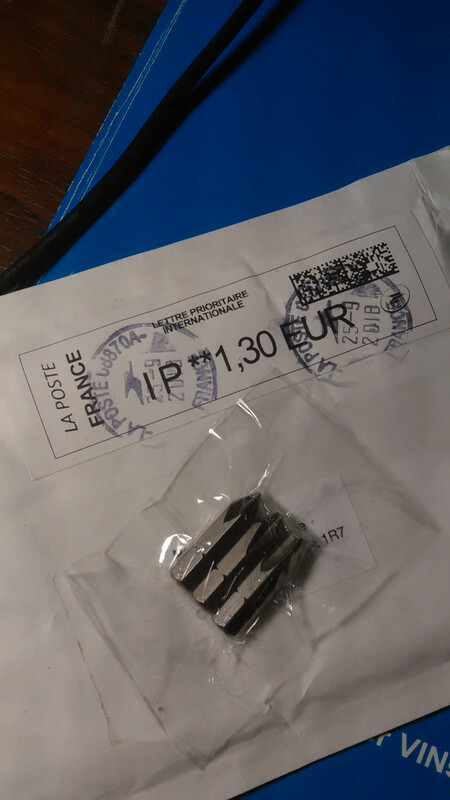 They cost $17 and shipped from France (of all places??). I haven't really used them yet but should come in handy when I need them. I have a dumb question to ask. How does the intake get so dirty ? Shouldn't it all be clean filtered air going through the intake. How does carbon get all the way to the IAC ? The air filter isn't 100% clean, and doesn't/can't filter 100% of the dust and stuff coming in. Plus the PCV usually pipes into the intake hose post-air filter. I'd bet around 90% of it is from PCV though. After you clean the IAC I would recommend disconnecting the negative battery terminal and resetting the ECU. I did this and it cleared for a little but it came back. Welp.... back to the drawing board.